Baghdad Medical City is a 2500 bed complex of Teaching Hospitals, the largest in the Middle East, built by Hyundai Construction & Engineering in the early 1980's. Described, at the time, as a Futuristic Medical Centre without comparison anywhere in the World. The 1300 bed teaching hospital (Phase 1) was built in 1970 running from a temporary plant room. 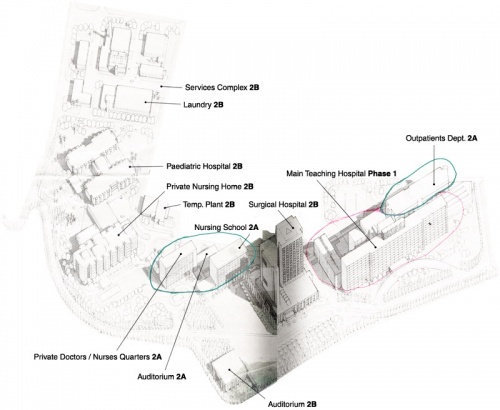 Phase 2A and 2B consisted of a 22 storey Surgical Hospital, Paediatric Hospital, Private Nursing Home, Nursing School, Private Doctors/Nurses Quarters, Laundry and Auditorium. The whole complex ran from a CUSC (Central Utilities Services Complex). The pipe services duct ran across the site from the CUSC for 5/8 to 3/4 of a mile containing 900mm (36") CHW F&R mains and No.1 and No.2 Steam mains both 450mm (18"). The duct also contained a 500mm Dia. Laundry Conveyor. Obviously the pipe sizes dropped away down the site. The CHW was connected with Victaulic Couplings safeguarding against contraction problems. The steam mains entering each block to provide LPHW and Secondary HWS via steam to water calorifiers posed many expansion problems. Eddy Warren spent many hours going through drawing layouts for R H Sanbar/Parsons Brown International Consulting Engineers' London Office. With Hyundai winning the contract Eddy went off to the Seoul Head Office of Hyundai. Very few projects come much bigger than this. Sadly today 3 decades later, with two Gulf Wars, the Iraqi economy hit with sanctions, many senior and junior medical staff and maintenance staff fleeing the country, the complex is in a sad operational state and state of repair. Very few of the lifts work and on a 22 storey hospital block this is bad news.